“I also believe that UCLA is at a key point in its history. I have told senior members of the University’s administration that we should accept $0 per year from the state. We need to go ‘cold turkey’ and not take another dime. Cutting our ‘financial lifeline’ would liberate us from silly Sacramento rules and signal to our thousands of alumni that it is up to them to step up and play a leadership role in supporting the school. The politicians in Sacramento have other priorities — somehow excellence is not one of them. UCLA pays its basketball coach and its football coach over $2 million each. This signals that either we really think that is valuable stuff or that we believe that it promotes donations to the school. In my vision for the ‘new UCLA’, the faculty will step up and make a serious case for why UCLA will continue to be a great school and in fact that we will improve as a research university because we have embraced free market principals. In capitalism, higher quality products feature a higher price tag. Substitute “University of Minnesota” for “UCLA” (and St. Paul for Sacramento). The situation here is not as dire as California, but this is a discussion we need to have. I suspect it will happen whether or not the U of Mn intends or embraces it, but planning for this kind of change will beat not-planning for it. 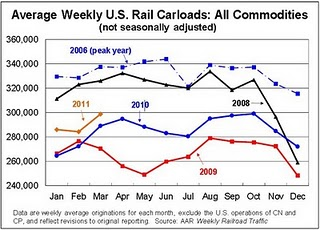 Calculated Risk: AAR: Rail Traffic increases in March: “The Association of American Railroads (AAR) reports carload traffic in March 2011 was up up 3.4% over March 2010 and 11.2% over March 2009, and intermodal traffic (using intermodal or shipping containers) was up 8.5% over March 2010 and up 21.6% over March 2009. Times are tough in the Twin Cities exurbs. Five years ago, they were among the fastest-growing cities in the nation, offering cheap land and acres of new homes at affordable prices. But the stunning collapse in the housing market and the devastating recession that accompanied it have turned the boom into a memory. The exurban communities, scarred by foreclosures, are still reeling from plummeting home values and the loss of business. From Isanti County south to Scott County, new roads lead to phantom neighborhoods. Many homes sit empty, their owners long gone, foreclosed. Now, with $4-a-gallon gas a possibility by summer, the prospect for recovery is bleak in these neighborhoods full of long-distance commuters. The downward momentum is a sharp contrast to that of a decade ago, when communities from Cambridge to Belle Plaine exploded with growth as young families looked beyond the suburbs to buy a piece of the American dream. Land and gasoline were cheap, and the tradeoff for a 45-minute or longer commute was a bigger, more affordable home compared to those closer in. Since 2000, the population in exurban Twin Cities counties has grown by 25 percent. Some — Chisago, Sherburne, Scott and Wright — saw gains of 30 percent or more. In the city of Isanti, the population nearly tripled, from 2,300 residents to more than 6,000 late in the decade. Anticipating continued growth and demand, developers and contractors built neighborhoods and homes faster than they could fill them. “Everybody was going nutso,” said Rojas, the bookstore owner. Then came the crash. Thousands went into foreclosure. Others were stuck in houses worth far less than what they paid. Acres cleared for construction stayed empty. And it’s not yet over. Statewide, foreclosures rose 11 percent — nearly 26,000 total — in 2010, with the greatest number in Hennepin and Ramsey counties. But the rate of foreclosure was greatest in the northern exurban counties of Sherburne, Isanti, Mille Lacs and Kanabec. Posted on Samizdata: Samizdata enraged rant of the day about the results of the composite problem of government granted monopolies, security theatre, and time sensitivity. … “However, once in a while one has a doosey of an experience, and I had one this morning. I was booked to fly from London Stansted Airport to Bologna in Italy. The flight was due to leave at 7.15am. I got up at an unpleasant 4.30am to leave for the airport. Transport to the airport was uneventful, and I arrived approximately an hour before my flight was due to leave. I was not checking luggage, and walking through the airpot and getting to the front of the security queue meant that I got to the X-Ray machine and metal detector at security by about 6.25am. I took my laptop out of my bag, and put it through the machine separately. The operator of the X-Ray machine apparently decided that there was something in my bag that required manual attention, as occasionally happens. It happens to me more than to most people, because I carry a fair amount of electronic equipment with me: fairly bulky photographic equipment, phones, chargers, a Kindle, accessories for the laptop and an assortment of chargers and adaptors to go with them. Yes, I am one of these people. No, this is not very unusual. As I said, this happens from time to time. Normally a security person takes my bag off the conveyor belt, and either conducts a manual search of the bag, or tells me to take a particular item out of the bag, and the bag and that item go through the X-Ray machine separately. No big deal, and I am delayed five minutes or less. However, this morning I discovered that security at Stansted Airport had installed a new system of conveyor belts, and the conveyor belt now forked coming out of the X-Ray machine. Problematic bags that required a manual search now ended up in a separate conveyor belt in a queue of their own. This meant that they did not need to be dealt with immediately to keep the main conveyor belt moving. I had no liquids in my bag, and I explained this. I was then told that I must have left a laptop in my bag. I pointed to my laptop, which I was holding in my hands. I was told that I must have left something I was not supposed to in my bag, as bags were only retained for manual searches when people had ignored the instructions in some way. A further five minutes or more were then taken to inspect the contents of my bag and put my electronic devices through the X-Ray machine again. The person doing this was distracted by other tasks several more times, and the bag search was done slowly and inefficiently. Thinking about it later, most of the other people in front of me whose bags were subject to manual searches did in fact have liquids in their bags that they had not taken out. This does appear to be the reason for most manual searches. This probably does annoy security staff as it creates extra work for them. This (combined with the ‘serves you right’ response when I mentioned I might miss my flight) makes me suspect that the delays in doing these manual inspections may not be simple incompetence, but something a little more malevolent than that. Surly, resentful employees are going out of their way to inconvenience passengers who are perceived as making things hard for them. All I had done was have a bag with slightly unusual contents. Other people might have accidentally left a laptop in a bag. (I have done this at other airports, and the delay has been perhaps 60 seconds. Not at Stansted today, though). The idiocy of the liquid ban comes into this too. Pointless rules make for pointless jobs and resentful, surly employees. I am still not sure how much of this was incompetence and how much malevolence. A bit of both, I suppose. As it happened, I did miss my flight. My short trip to Italy is cancelled. I am out of pocket the cost of my non-changeable, non-refundable flight, the cost of transport to the airport, and the cost of one night’s accommodation in Italy, the hotel at which I had a reservation having an ‘In the event of a same day cancellation, the cost of one night’s accommodation will be charged’ policy. Annoying for me, but no fault of any of those businesses, of course. The rental car company (Europcar) with which I had a vehicle booked were nice enough to give me a full refund, however, so I will be doing business with them again. Plus I had got up at 4.30am and wasted a morning for no reason. And I am not sitting beside the Adriatic eating pasta and drinking chianti, which was where I had intended to be this evening, and in fact where I paid good money to be this evening. So who do I blame for this? The security employees themselves, certainly. Governments who impose stupid security rules, of course. BAA, the company that owns Stansted Airport, certainly. The botched privatisation process of London’s airports, that too. (BAA was a government department that was privatised with a monopoly over London’s airports. It still has the attitude to customer service that one expects from a tax department. Or perhaps the post office. Or the NHS. Or a railway ticket office in Smolensk in 1983. A heavily regulated private sector monopoly that behaves like a government department is not a dramatic improvement on a government department). To some extent complaining about security procedures at airports is like complaining about the fact that water is wet. These things just are. However, I cannot help but think that an appropriate level of outrage is appropriate. “Now, exposure to pollution particles roughly one-thousandth the width of a human hair has been linked to brain damage in mice, including signs associated with memory loss and Alzheimer’s disease, according to a USC study in the journal Environmental Health Perspectives.